CPT received a story from a journalist who was beaten on January 15, 2017. He wanted to share his story in hopes that people around the world will know what is happening in this region. This is Karwan Haji Shamo’s account of the events of that day. Party (KDP) office in Bahadre. I said that they are the reason behind people from Bahdre not getting hired by the many international companies operating in the area. At the beginning the Mayor and Asaish didn’t have a negative response, but the head of the KDP office from our area called me and asked me to delete the post from my Facebook. I refused his order. Two days after I received this phone call he sent three armed people to my home. When they arrived it was nine o’clock in the morning. I was just leaving for my office. As soon as the men approached they just started to beat me. Then they took me to the KDP office in Bahadre. Once there, they put me in an upstairs room where I was beaten unconscious. I woke up to them throwing water on me and I saw blood all around. 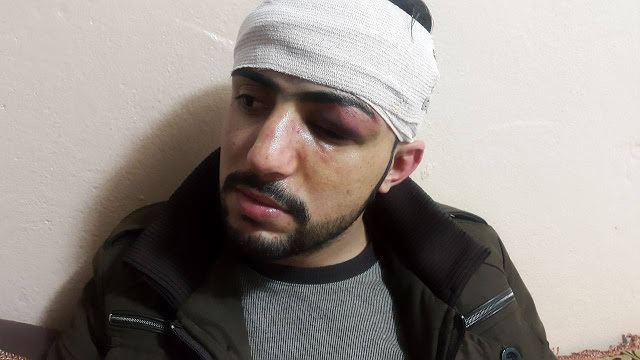 The head of the KDP office told me, “You should not go out with bloody clothes on,” but I refused to change my clothing until I arrived at the hospital.